Whether youâ€™re passing through Oban on the way to the Islands, or staying for a couple of days and exploring historic and beautiful Argyll, the original Oban Backpackers is the place for you! 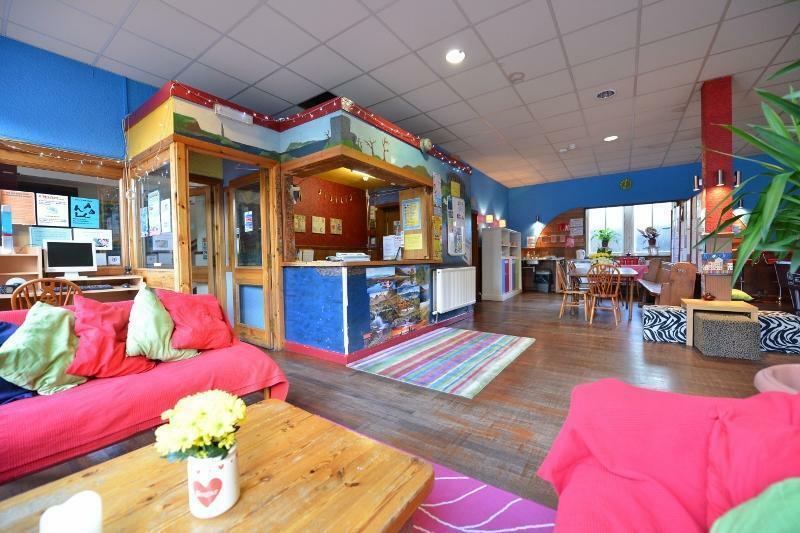 Our funky hostel is part of the World famous â€˜Scotlandâ€™s Top Hostelsâ€™ chain and we look forward to welcoming you to Oban. If any of the people in your group are under the age of 17, please contact us directly. Translated from its Gaelic tongue to mean â€˜small bayâ€™, Oban is an idyllic horseshoe bay sheltered from the Atlantic by the isle of Kerrera. Also known as the â€˜Gateway to the Islesâ€™, this is the largest port in North West Scotland and boasts spectacular views across to the Hebridean islands. In particular, the view at dusk from McCaigâ€™s Tower provides a sunset you are unlikely to forget. Like any small port, there is a lot going on in Oban; the bustle of fishing boats, ferries, yachts and sea birds make the waterfront a lovely place to be. Follow the A85 into Oban and as you arrive you will start to drive down a steep hill. Take the first left hand turn into Deanery Brae beside the Arbour Guest House. At the next junction, turn right onto Breadalbane Street. Follow this road along and you will see our hostel on your left hand side. Just look out for the red arch windows. There is metered parking outside the hostel or our staff can direct you to a nearby free car park. Follow the A816 Soroba Road towards Oban. As you arrive into Oban go straight on at the roundabout by the Fire Station. Follow the road along to a set of traffic lights beside the high school. Go straight on at the lights and continue to the town centre. At the roundabout at Argyll Square, turn right onto Airds Place. Follow this road along the seafront and past Oban Bay until you reach a roundabout at the end of the promenade. Take the second exit at this roundabout heading up the hill. At the next roundabout, take the first exit and continue up the hill. Then take the first right hand turn into Deanery Brae beside the Arbour Guest House. At the next junction, turn right onto Breadalbane Street. Follow this road along and you will see our hostel on your left hand side. Just look out for the red arch windows. There is metered parking outside the hostel or our staff can direct you to a nearby free car park. From the bus, train & ferry terminals in the centre of town, follow George Street with the sea on your left. The road will fork twice; stick to the right both times, and we're just up past the Cinema and Taj Mahal Indian restaurant on your RIGHT hand side. Look out for the red arch windows!